An engineering student is investigating the use of drones and laser scanning technology to boost infrastructure monitoring capabilities in South East Queensland. 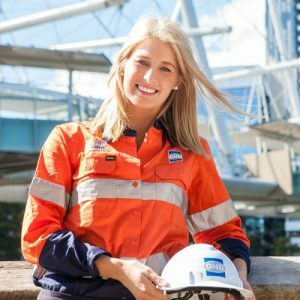 Currently in her fourth year of study, Monique Quirk, a civil engineering student at Griffith University, has a keen interest in tunnelling and geotechnical engineering as well as construction, and is using an industry placement with GHD to build skills in order to complement her degree. “My project with the company is to look into alternative technologies to inspect and model the current condition of bridges and piers around Brisbane, while identifying cracks or defects that might affect the integrity of the structure,” she explained. GHD undertakes both visual inspections and desktop-based modelling of existing bridges in order to assess the current conditions of structures and establish an overall condition rating, as well as maintenance recommendations. Their studies help authorities determine the capacity of the structures under current and future rail traffic, and whether governments need to impose speed restrictions or weight limitations for travel on structures that do not achieve current or future proposed loading requirements. As technology evolves, the company is also exploring new ways to inspect and assess structures. “We use drones and laser technology to scan the structure and then input it into modelling-based programs for assessment,” Quirk said.